Real Housewife Brandy Glanville joined The Doctors to discuss some hot topics. Dr Travis Stork explained that a recent essay went viral that tells the story of a woman who ended up in debt. Debt or financial issues can potentially cause a woman to feel stuck in a relationship. Brandy spoke up saying that women should always be able to take care of themselves financially. Dr Jennifer Ashton shared that she has patients who financially, cannot afford to leave their husbands. Financial independence is ideal, but things happen. Dr Stork said the one positive to the article is the suggestion to be a little more frugal for a few months if you don’t have an emergency fund. The Doctors then met Hamid, a man who calls himself a “transformer” because he transforms successful, powerful men who are overweight or self-conscious and can’t seem to meet the right woman. He helps them lose weight, improves their physical appearance, dresses them up, and takes them out to meet women. He has a 40-person waiting list for men who want to work with him in New York City and claims that he’s pretty successful in helping his clients. He claimed that he helped a man lose 85 pounds and transform his look in time for his wedding just 15 weeks later. The Doctors called Hamid out for being a bit cocky, and he claimed that he had to be that way because of the clients we works with. The Doctors then switched gears to share that more than two million people in the U.S. suffer from sudden and uncontrollable seizures. Allie shared with The Doctors that about a year go, she fainted early in the morning, but then went to work thinking nothing of it. When she got home from work, she fainted again and hit the bottom of her face on the sink. She went to the hospital to check for a concussion, and when they did an CAT scan, they didn’t find anything. The ER doctor told Allie that something didn’t feel right, so they admitted her and did an MRI. About ten minutes after she was admitted, she had a stroke. After getting the MRI, doctors found AVM, which is arteriovenous malformation. AVM is a tangle of abnormal blood vessels connecting arteries and veins to the brain. Because it was already starting to rupture, they were going to take part of her skull out and take it out of her brain. That was the day she got married, because they were told she had a 40-60% chance of living through the surgery. After the surgery, she went to the rehab unit to learn how to walk and talk again. She was sent home but learned that epilepsy is common after a brain bleed. 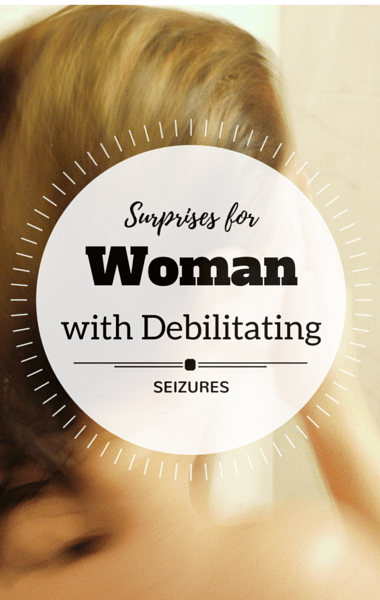 In the past ten months, she’s had about 35 seizures. She can no longer go anywhere alone which means she has lost her independence. About four months ago, she had a severe seizure. When her husband got home, he found her on the bathroom floor unconscious. She ended up in a wheelchair for more than two months. Her husband admitted that he’s constantly worrying about her, and Allie admitted that she wants nothing more than to be independent without her family worrying about her. Allie has been crowdfunding for a dog that could potentially save her life. The dogs are trained to help their owners and give them the independence they desperately want. The dog could even potentially warn Allie of an oncoming seizure. Allie has been flooded with support, so she has no doubt that she’ll reach her goal. The Doctors surprised Allie with a special watch that can sense when a seizure is coming and alert emergency contacts. PetCo also donated the $6,500 Allie still needed to reach her goal of getting the dog that would change her life. Allie was overwhelmed with gratitude and brought to tears.